Your logo is the first step in constructing your practice’s identity. It should attract your patients’ attention and leave a lasting impression. It also should be easy to reproduce for letterhead and recognizable in black and white and fax transfers. We will evaluate existing branding material and revitalize your practice’s identity. 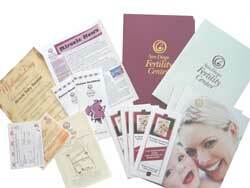 Large Brochure: Your practice’s brochure is the first impression you hand to your patients. In our experience, the pocket folder brochure seems to be a popular option because of its universal functionality. With a pocket for new patient forms, letters, pamphlets and CDROMs and a business card slit in the back, it fits many purposes. Small Tri-fold: Even a small four-color trifold brochure is more effective than just some paragraphs on letterhead stapled together. Creation and production can be completed within weeks. No time for writing your own content or finding photos? We will assist you creating a new brochure, developing text and graphics and guide you through the production process all the way to print delivery to your office. For how many years have you renewed that advertising contract with the local newspaper? Do you have a nice column ad in the Yellow Pages? What’s your message in the current ads? We will review your current contracts and increase your exposure in the most effective publications. Also, a compelling “call to action” marketing message will be placed in your print advertising campaigns. However, don’t be surprised if we recommend decreasing the print advertising dramatically to optimize your marketing. A well-informed patient is an excellent patient. For example, offering your information in compelling online videos to your patients is a reflection of your excellent patient care. In our experience, medical practices and their staff value the convenience of our multimedia patient care products. After a development process, the videos can easily made available to an unlimited number of patients worldwide. We will evaluate existing patient education material and develop a new high impact tool of today that enhances your existing marketing message. Do you know how happy your patients really are? Happy patients tell their friends about your excellent services! Word of mouth is crucial for the medical profession. We will research and analyze your patient satisfaction. Solutions to existing problems will be suggested and a plan for implementation will be developed. This service is also tied to our online reputation management. Referrals from peer physicians are traditionally the number one source of patients. We assist you in strengthening and maintaining the relationship and introduce your practice to new referring physicians. If you are working together with other physicians, practices or businesses in the field, we will assist you in creating your own internal affiliate program. We will do the research and leverage your contextual network data to find affiliates for your practice. Take advantage of our marketing services on a monthly basis! Agreements start at $1000 per month. Contact us today!